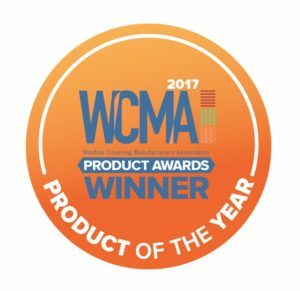 For the past 27 years, the Window Covering Manufacturers Association (WCMA) has recognized “the best” in product innovations, fresh designs, and merchandising programs throughout the window covering industry. Originally organized in the 1950s as the Venetian Blind Council, the WCMA represents the interests of the window covering industry manufacturers, fabricators, and assemblers. It was announced in March that Hunter Douglas had once again been awarded the 2017 Product of the Year award for the 11th year in a row. Hunter Douglas’ Sonnette™ Cellular Roller Shades were name “Product of the Year” for 2017. These shades also won “Best New Style Concept” in the Cellular and Pleated Shades category and “Best New Style Concept” in the Roman and Roller Shades category. Sonnette™ Cellular Roller Shades are an update to the classic cellular shade. Sonnette shades combine the best properties of two of Hunter Douglas’ best-selling window treatments. They reimagine roller shades by combining the clean lines of a standard roller with the innovative design of their original energy-efficient honeycomb shades. Sonnette shades gently diffuse light through an innovative, curved shape. Offered in three cordless operating systems for safety, convenience and ease of use. Available in 48 colors, from whites to brights, in semi-opaque and room darkening opacities, Sonnette™ Cellular Roller Shades complement and enhance your space and lifestyle needs. SoftTouch™ Motorization is a new battery-powered lift system designed for intuitive wand-controlled shade operation of select Hunter Douglas shades. Gently pull down to close your shades and slightly push up to open them. Users can also set a favorite position to quickly operate the shade and walk away while the shade quietly moves to the desired position. SoftTouch™ Motorization has no exposed operating cords for superior child safety. Duette Magnetic Hold-Down brackets provide the ideal solution when mounting Duette honeycomb shades on a door or window. The hold-down bracket securely holds the bottom rail in place when needed and releases with ease when raising the shade. Our Magnetic Hold-Down bracket aesthetic has largely improved from the previously used clear plastic clips. The previous version of the hold-down bracket would have to physically be unhooked from the bottom rail. Now, the magnet allows consumers to easily secure and release. Silhouette Window Shadings enable consumers to decide if superior light diffusion our superior view is most important. Silhouette ClearView Shadings are the newest choice when consumers want supreme view-through combined with light control. Compared with classic Silhouette ClearView shadings feature a specialized front sheer and rear blacksheer combination, optimizing the view while providing UV protection. Schedule an in-home appointment with one of our window treatment designers or stop by one of our stores. At Hirshfield’s, we have the largest selection of Hunter Douglas window treatments in Minnesota with 16 showrooms featuring their premiere collection of blinds and shades. Hirshfield’s stores in Fargo, Eau Claire, and Sioux Falls also carry Hunter Douglas window treatments.